Often the garage is a catch-all for the many items we need to store, but don’t know exactly where to put them. In most cases, the garage is the ideal storage space. However, sometimes storing chemicals and tools in the garage can be dangerous and even hazardous to your health. These garage storage tips will help you determine what items are safe to store in the garage and how to store them without threatening your heath, harming your family or causing damage to your new home. · Road salt and ice-melt mixtures can be very harmful to children and pets. Store these items in childproof, non-spill containers. Place them on a high shelf, in a high cabinet or in a locked garage closet out of reach of children. · Do not store auto fluids, paints or pesticides in old food containers or containers that do not have tightly sealed lids or caps. These containers might leak causing burns, fumes, respiratory problems and fire hazards. · Sweet smelling anti-freeze may be very attractive to pets, but it can kill them. As little as one tablespoon can make your pet (or child) very sick or even be deadly to cats and small dogs. Make sure caps are sealed tightly on all anti-freeze bottles and store out of reach of children and pets. · Propane is extremely combustible. A single spark of static electricity or flip of the light switch could ignite nearby propane causing an explosion. It is necessary to store propane containers and anything that uses propane away from the home in a storage shed, detached garage or other outbuilding. Do not store propane in your attached garage. · Get in the habit of storing all chemicals in their original containers complete warning labels so you know what is inside and what dangers or threats each may pose. Store these in a safe place out of reach from children where they will not fall or spill. Chemicals are best stored away from the home in a detached garage or a shed rather than in an attached garage. · Ladders should be stored against a wall or at floor level using storage hooks to secure them. Ladders stored vertically or not securely fastened to the wall can easily tip or fall harming people and damaging property. · Store lawn and garden tools and other small hand tools such as pliers, a hammer or screw drivers in a secure place such as a toolbox. Lock the tool box if possible. · Store tools, especially those with sharp blades and points, out of reach from children. However, be sure they are easily accessible to you without having to balance tools overhead or reach dangerously overhead. 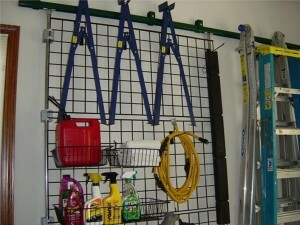 · Use peg board and hooks to hang long-handled items on the garage wall such as shovels and rakes. Secure them tightly to the wall. · Make sure all power tools are turned off before storing after each use. · Place heavy and bulky tools and items on low shelves or on the floor preventing them from falling. Make sure all sharp points and edges face the wall preventing someone from getting hurt if they bump into the sharp and pointed edges. · Check all extension cords that are stored or used in the garage to be sure they are rated for outdoor use due to possible moisture. Those not rated for outdoor use are a potential hazard. Read more home safety tips from The House Plan Shop.